If you are looking for pallet racking systems in San Bernardino, CA, look no further than Warehouse Racking Systems. Contact one of our friendly sales staff in San Bernardino to review your needs. Warehouses use pallet rack systems to store goods. Pallet rack systems help the flow of product from receiving to shipping areas. This can improve the productivity of your workers. In addition, it helps to organize the inventory and keep records that are more accurate. Check out our pallet racking products specs. Pallet racks are made of steel and come in a variety of configurations. Pallet racks consist of at least two uprights and several cross beams that hold pallets in place. Several types of pallet racks exist. Some of those are drive-through, carton flow, and push back. In order to optimize warehouse space, a few things must happen. An evaluation of the structure and workflow needs to happen. This includes the size of the facility. The locations from where goods are loaded and unloaded. As well, as the inventory method in use and how often this occurs. A good design allows the product to flow in and out of your warehouse in a timely manner. A great layout keeps goods organized. It makes inventory tasks much easier and the counts more accurate. If your current vendor is not asking about these objectives, then their solution is not for you. If you are looking for a new pallet rack system, we can make a customized solution that fits your budget. Our pallet rack experts will be happy to conduct an on-site survey and provide you with a FREE ESTIMATE. Warehouse Racking System – San Bernardino makes racking from 100% US steel. Therefore, they are stronger and more durable than imports. Using heavy gauge steel ensures that they will hold more weight. The applied powder coating protects them from scratching. They are available in green and orange plus a wide variety of colors. These pallet racks have been load tested and are ready for delivery. If you are looking for pallet racking systems in Riverside, CA, look no further than Warehouse Racking Systems. Contact one of our friendly sales staff in Riverside to review your needs. Warehouse Racking System – Riverside makes racking from 100% US steel. Therefore, they are stronger and more durable than imports. Using heavy gauge steel ensures that they will hold more weight. The applied powder coating protects them from scratching. They are available in green and orange plus a wide variety of colors. These pallet racks have been load tested and are ready for delivery. If you are looking for pallet racking systems in San Diego, CA, look no further than Warehouse Racking Systems. Contact one of our friendly sales staff in San Diego to review your needs. Warehouse Racking System – San Diego makes racking from 100% US steel. Therefore, they are stronger and more durable than imports. Using heavy gauge steel ensures that they will hold more weight. The applied powder coating protects them from scratching. They are available in green and orange plus a wide variety of colors. These pallet racks have been load tested and are ready for delivery. If you are looking for pallet racking systems in Santa Ana, CA, look no further than Warehouse Racking Systems. Contact one of our friendly sales staff in Santa Ana to review your needs. Warehouse Racking System – Santa Ana makes racking from 100% US steel. Therefore, they are stronger and more durable than imports. Using heavy gauge steel ensures that they will hold more weight. The applied powder coating protects them from scratching. They are available in green and orange plus a wide variety of colors. These pallet racks have been load tested and are ready for delivery. 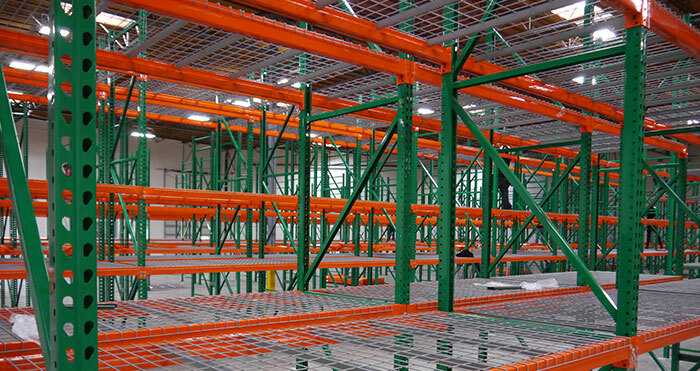 If you are looking for pallet racking systems in Rancho Cucamonga, CA, look no further than Warehouse Racking Systems. Contact one of our friendly sales staff in Rancho Cucamonga to review your needs. Warehouse Racking System – Rancho Cucamonga makes racking from 100% US steel. Therefore, they are stronger and more durable than imports. Using heavy gauge steel ensures that they will hold more weight. The applied powder coating protects them from scratching. They are available in green and orange plus a wide variety of colors. These pallet racks have been load tested and are ready for delivery. If you are looking for pallet racking systems in Los Angeles, CA, look no further than Warehouse Racking Systems. Contact one of our friendly sales staff in Los Angeles to review your needs. Warehouse Racking System – Los Angeles makes racking from 100% US steel. Therefore, they are stronger and more durable than imports. Using heavy gauge steel ensures that they will hold more weight. The applied powder coating protects them from scratching. They are available in green and orange plus a wide variety of colors. These pallet racks have been load tested and are ready for delivery. If you are looking for pallet racking systems in Ontario, CA, look no further than Warehouse Racking Systems. Contact one of our friendly sales staff in Ontario to review your needs. Warehouse Racking System – Ontario makes racking from 100% US steel. Therefore, they are stronger and more durable than imports. Using heavy gauge steel ensures that they will hold more weight. The applied powder coating protects them from scratching. They are available in green and orange plus a wide variety of colors. These pallet racks have been load tested and are ready for delivery. If you are looking for pallet racking systems in Phoenix, CA, look no further than Warehouse Racking Systems. Contact one of our friendly sales staff in Phoenix to review your needs. Warehouse Racking System – Phoenix makes racking from 100% US steel. Therefore, they are stronger and more durable than imports. Using heavy gauge steel ensures that they will hold more weight. The applied powder coating protects them from scratching. They are available in green and orange plus a wide variety of colors. These pallet racks have been load tested and are ready for delivery. If you are looking for pallet racking systems in Redlands, CA, look no further than Warehouse Racking Systems. Contact one of our friendly sales staff in Redlands to review your needs. Warehouse Racking System – Redlands makes racking from 100% US steel. Therefore, they are stronger and more durable than imports. Using heavy gauge steel ensures that they will hold more weight. The applied powder coating protects them from scratching. They are available in green and orange plus a wide variety of colors. These pallet racks have been load tested and are ready for delivery. If you are looking for pallet racking systems in Anaheim, CA, look no further than Warehouse Racking Systems. Contact one of our friendly sales staff in Anaheim to review your needs. Warehouse Racking System – Anaheim makes racking from 100% US steel. Therefore, they are stronger and more durable than imports. Using heavy gauge steel ensures that they will hold more weight. The applied powder coating protects them from scratching. They are available in green and orange plus a wide variety of colors. These pallet racks have been load tested and are ready for delivery.